I met a fellow this week who during his conversation with me said, “instead of looking at what we’re doing differently, we ought to be celebrating what the denominations are doing right.” He then cited the example of a denomination’s sound finances. As the conversation went on, he repeated this sentiment, the idea of “celebrating what’s right and ignoring what’s wrong. This has mass appeal in our ecumenical society. When shown the passage; “Now I beseech you, brethren, by the name of our Lord Jesus Christ, that ye all speak the SAME thing, and that there be no divisions among you; but that ye be perfectly joined together in the SAME mind and in the SAME judgment.” 1 Corinthians 1:10 (emphasis mine), he swept it away as just a request Paul had and not a requirement of the Lord. [cf. 1Cor 14:37]. He said, “I’m not about logic and reasoning.” Then the conversation was over. They tell us to JUST preach Jesus, His love and His grace. The thing is…we are preaching Jesus, His love and His grace, we’re just including the parts that they have left out. Leaving out key parts of the information is not to tell the truth, the whole truth and nothing but the truth. Before we go on, let’s take a small detour back to the time when Abram (later changed to Abraham) was in Egypt [Genesis 12:10-20] when he was afraid the Egyptians would kill him to take his wife. He told the Egyptians the truth, that Sarai (later changed to Sarah) was his sister. Scripture tells us that she is the “daughter of my father, but not the daughter of my mother; and she became my wife” [Genesis 20:12]. Abraham and his brother had married sisters. This made Sarah both Abraham’s wife AND his sister in law. So technically, he didn’t lie. However, we all know that the whole truth wasn’t conveyed. He told a story to protect his life but didn’t identify her as his wife. With that before us, let’s return to the main point. Preaching anything less is to come short of salvation. Let us speak the truth about Jesus, His love and His grace and let’s do it with LOVE. 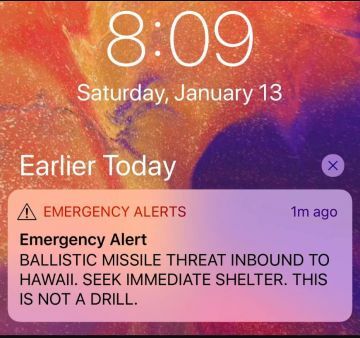 Last week an erroneous alert went out when a Hawaii Emergency Management Agency employee triggered a ballistic missile alert, and people freaked out. Rightfully so, what would you do if you learned that a nuclear missile was rocketing toward you? It was a normally beautiful winter day. Winter in Hawaii starts out in the mid 70’s and sunny. A Saturday in Hawaii would have found folks, sleeping in, getting ready for a wedding, going to work, babies being born and at least one man suffered a heart attack triggered by the startling alert. Being a popular vacation spot, there were many thousands of tourists beginning or finishing their vacations. In other words, everything was normal. As many of you already surmise, this article is not going to be about preparedness for a Global Thermonuclear War. We talk about spiritual issues here and this incident is an exceptional illustration of what will take place when Jesus returns. He will return, it’s been promised. “Which also said, Ye men of Galilee, why stand ye gazing up into heaven? this same Jesus, which is taken up from you into heaven, shall so come in like manner as ye have seen him go into heaven” [Acts 1:11]. Unlike in Hawaii, there will be no advanced notice of His appearing. “But of that day and hour knoweth no man, no, not the angels of heaven, but my Father only” [Matthew 24:36]. The world will be “acting normal” just as they did that morning in Hawaii. “And as were the days of Noah, so shall be the coming of the Son of man. For as in those days which were before the flood they were eating and drinking, marrying and giving in marriage, until the day that Noah entered into the ark, and they knew not until the flood came, and took them all away; so shall be the coming of the Son of man” [Matthew 24:37-39]. Just as a thief catches the victim by surprise, so too will be the coming of our Lord and Savior, Jesus Christ. “But the day of the Lord will come as a thief; in the which the heavens shall pass away with a great noise, and the elements shall be dissolved with fervent heat, and the earth and the works that are therein shall be burned up” [2 Peter 3:10, cr. 1 Thess 5:2]. There will be no sirens, but there will be trumpets louder than any you’ve ever heard. It will be the trump of God. “In a moment, in the twinkling of an eye, at the last trump: for the trumpet shall sound, and the dead shall be raised incorruptible, and we shall be changed” [1Corinthians 15:52]. All of this means is that there just will not be any time to obey the gospel [2 Thessalonians 1:7-8]. To those of you who believe the error of “faith alone,” that also will fail, for the very instant Jesus appears in the sky is the moment “faith” will end. “Now faith is assurance of things hoped for, a conviction of things not seen” [Hebrews 11:1]. Faith ends at sight. Scripture reveals no prayers an infidel could utter to place them in a right relationship with God. Only faithful obedience to the Gospel can do that through Christ Jesus. Here’s what else will happen on that day; “For this we say unto you by the word of the Lord, that we that are alive, that are left unto the coming of the Lord, shall in no wise precede them that are fallen asleep. For the Lord himself shall descend from heaven, with a shout, with the voice of the archangel, and with the trump of God: and the dead in Christ shall rise first; then we that are alive, that are left, shall together with them be caught up in the clouds, to meet the Lord in the air: and so shall we ever be with the Lord” [1 Thessalonians 4:15-17]. The key to this verse are two simple words, “IN CHRIST.” The location of Salvation is “IN CHRIST.” Every spiritual blessing is “IN CHRIST” [Ephesians 1:3]. We are “IN CHRIST” when we have “PUT ON CHRIST” through water baptism by faith. “For ye are all the children of God by faith in Christ Jesus. For as many of you as have been baptized into Christ have put on Christ” [Galatians 3:26-27]. The only way we’re going to escape any and all catastrophes is to be “IN CHRIST.” When one is in Christ, what looks like a disaster, will be the most wonderful celebration any could ever imagine. It’s difficult to wrap our minds around the idea that God allowed slavery. What’s also strange to us is that a slave could submit himself to slavery (why would anyone do that? ), and if he wanted to leave, the master had to let him go free. Even more strange to our sensibilities is that the slave could decide to remain with a master he loved. We’re most familiar with the brutal history of slavery in our own country where a person was stolen into slavery, or born into slavery and could never leave of his own free will. So, how could it ever be that a slave would ever love his master enough to stay? As much as we detest the slavery we read about in history (and rightfully so), that slavery bears no resemblance to the master / servant relationship we read about in scripture. Some will say that any form of slavery is detestable, biblical or otherwise. Before you jump to that conclusion, let’s examine why God might use the example of slavery. The New Testament uses the biblical example of slavery to help us to understand our relationship with Him. Just as in the Exodus 21 passage, we come to Him of our own free will, and He BUYS us. The purchase price being His own blood. We can choose to leave this arrangement, also of our own free will. While nothing can separate us from the love of God [Romans 8:38-39], we can separate ourselves from Him. [Hebrews 2:3, 10:28-29, Galatians 5:4; 2Timothy 4:10]. Although the thought of becoming a slave holds a very negative meaning in our culture, the Holy Spirit had no trouble using this institution as an example. When you consider the love behind the sacrifice of Christ, you realize that God had placed an incredible value for your life. When we consider the price paid, and the promises made, it begins to make sense how a slave might Love a Slave Owner. Understanding these things will give us strength to endure this life. Looking again at Exodus 21, we note verse 6; “and he shall serve him for ever.” Applying the picture of slavery to us, we need to note that by becoming a slave to Jesus, we are placing His will above our own. We will have no other master, including those things that tend to rule in our lives [e.g. sin Romans 6:6; money Luke 16:13]. Thy will be done, becomes our song. Lord I’m here to stay. A free man I’ll never be. So, Pierce my ear, O Lord my God. Take me to your door this day. For I will serve no other God. O Lord I’m here to stay. There is much in the world of politics being called “FAKE NEWS.” Although that’s a kitschy catchphrase, the concept is hardly new. We can trace it all the way back to the very beginning when the serpent tempted Eve with his own FAKE NEWS on God’s command. “Ye shall NOT surely die.” [Gen 3:4 emphasis mine]. In Deuteronomy, Moses warned the children of Israel not to change God’s word. 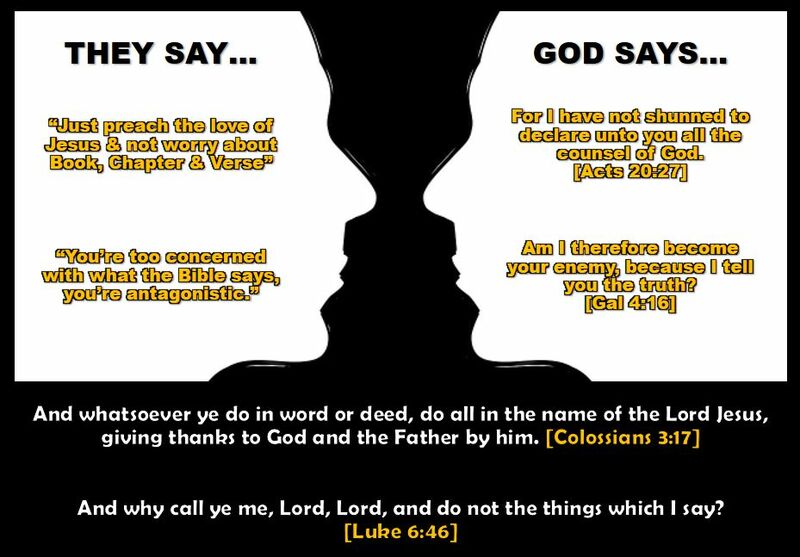 “Ye shall not add unto the word which I command you, neither shall ye diminish ought from it, that ye may keep the commandments of the LORD your God which I command you.” [Deut 4:2]. In the New Testament, John as given the same warning in Revelation 22:18-19. JUST ASK JESUS INTO YOUR HEART. This perversion is the most common “FAKE GOOD NEWS” that I hear. This alteration to the Gospel message follows the exact same pattern Satan used in Genesis 3 by just adding a simple 3 letter word…NOT. 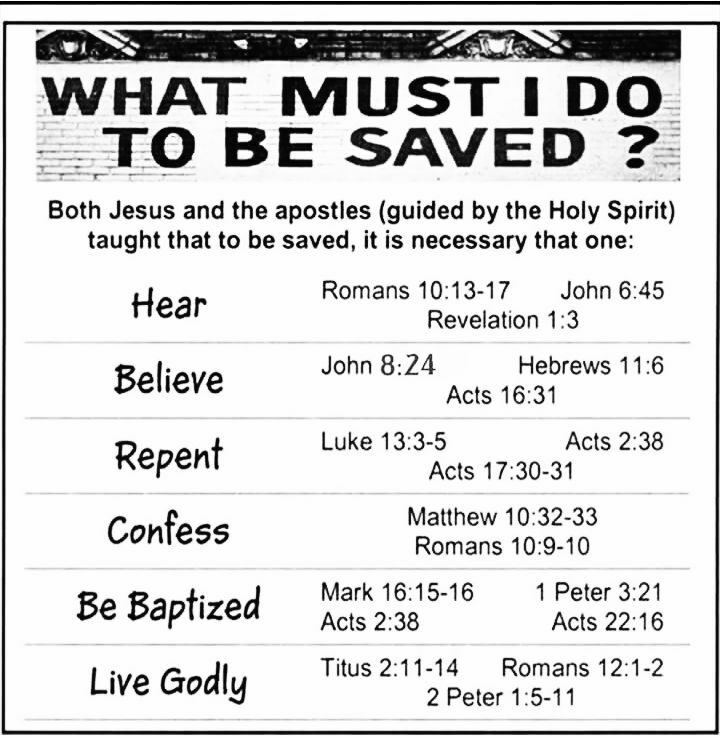 In Mark 16:16 it says, “He that believeth and is baptized shall be saved;” However, those being deceived are being told, he that believeth and is NOT baptized shall be saved. It’s as plain as day, Satan’s devices are being utilized by those promoting error, just add the word NOT. GOD DOESN’T CARE HOW YOU WORSHIP IF YOUR HEART IS IN IT. Another way this “FAKE GOOD NEWS” is propagated is with this statement, “I DON’T SEE ANYTHING WRONG WITH IT.” Both statements place the speaker in the position of God!! Just because you can’t see anything wrong with it doesn’t make it scriptural. The only way you can know what God care’s about is if you read what He revealed. Do these people even know that it’s possible to worship in vain? GOD WANTS YOU TO BE HAPPY… Lastly, for the sake of this article, this piece of “FAKE GOOD NEWS” is probably the most deceiving. Everything about this statement sounds great. To argue against it poorly is to sound like you’re advocating that God wants us to be unhappy. What people forget is that sin almost always looks attractive. God’s word says sin can be, “pleasurable” in Hebrews 11:25; “enticing” in Colossians 2:4 & Proverbs 1:10. God has given us wonderful blessing to enjoy [1 Timothy 6:17], but Satan has taken these pleasures and perverted them with his lies to turn us away from serving God. Our Father in Heaven DOES want us to be happy, and has given us instructions through His word on how to have joy in this life. Friends, my hope is that all of you want to go to heaven to be with the Lord. I do too, but no one shall get to heaven by believing the “FAKE GOOD NEWS.” I know that you love God. He sure does love you, [John 3:16]. He sent His Son, Jesus, to reconcile us back to Himself and I know you love Jesus too. Jesus said, “If ye love me, keep my commandments.” He is the only way. [John 14:4-15]. After a person obeys the gospel, the most oft asked question is, “what do I do now?” However, this question is asked by both the new convert AND the members of the local congregation. The new convert, full of joy and gratitude, has a desire to serve and to do what is right. The older members want to help them, but where do you begin? For the answer, let us turn to Acts 2, the place where the church of Christ began. 41 Then they that gladly received his word were baptized: and the same day there were added unto them about three thousand souls. That’s where we are with Margie, and all others who obeyed the gospel recently (a young man named Nick, was also baptized into Christ on the same day.) Nobody joins the church; the Lord adds to the church . So, the first thing we need to do is to continue to learn through study of the Scriptures what Jesus expects from us. The most effective way to do this is for the new convert and the “old” members to get together and study the scriptures. We need to note that “continue” means to do them. It’s not enough to learn what Jesus wants, we must obey Him [John 14:15]. We can also learn when we gather to worship on the first day of the week. And Fellowship and in breaking of bread, and in prayers. The new Christians worshiped together. They had fellowship, which means that they were in partnership with one another. This partnership begins when we, “all speak the same thing, and that there be no divisions among you; but that ye be perfectly joined together in the same mind and in the same judgment” [1Cor 1:10]. The partnership also includes the collection of money for the work of the church. (As you continue to study, you’ll begin to understand the work God has given the church is to spread the Gospel, Teach the saints and practice limited benevolence). The Philippians gave money to spread the gospel, and were in fellowship in the gospel [Phil 1:3-7]. One of the parts of worship (there are 5 activities in sound worship) the disciples ‘broke bread’ which is to remember the death of our Lord and Savior, Christ Jesus. Commonly referred to as “The Lord’s Supper” the first Christians met on the 1st day of the week, Sunday, where they would take unleavened bread and fruit of the vine to commemorate His death. The Apostle Paul wrote the early Christians how to properly observe this important part of our worship [1Cor 11:23-34]. They also prayed. Prayer is the privilege of the saints. Christians are called saint in the Scriptures [Rom 1:7; Eph 1:1; Phil 1:1; Col 1:1]. In obeying the gospel through baptism, we have “put on Christ” [Gal 3:27] and have been given access through Him to the “throne of grace” [Heb 4:16]. Prayer is an incredible part of becoming a child of God. We know that God does not listen to sinners [John 9:31] but He hears us! God is not our “genie in a bottle,” to gift us with everything we want like a spoiled child. Rather, He wants to help us in our time of need. It says in Hebrews 4:16; “that we may obtain mercy, and find grace to help in time of need.” Temptation doesn’t stop when we become Christians, neither do troubles & pains, “but God is faithful, who will not suffer you to be tempted above that ye are able; but will with the temptation also make a way to escape, that ye may be able to bear it” [1Cor 10:13]. So, all Christians need to pray. 47 Praising God, and having favour with all the people. As you begin your journey as a new Christian, and every Christian, let us never forget from whom we received the gift of grace. We received it from God through Christ Jesus [Eph 2:8-10]. May we never forget, may it never grow old and may we never grow tired of praising God for His indescribable gift. Thanks be unto God for his indescribable gift. On August 21st millions of Americans will be gazing into heaven as North America experiences a Total Solar Eclipse that crosses the U.S. in a way that hasn’t occurred since 1918. Everyone in the contiguous United States will experience at least a partial eclipse, with totality being along a 70 mile wide path from Lincoln Beach, Oregon to Charleston, South Carolina. The window of opportunity to view the eclipse will be about two minutes and 40 seconds, a very narrow window indeed. Looking directly at the sun, as we’ve all learned, can be extremely harmful to your eyes. You must never look directly into the sun without ISO 12312-2 certified eclipse viewing glasses. There is a word of warning, without the ISO 12312-2 certified eclipse viewing glasses, you will permanently damage your eyes. Some may say, “I have some really dark sunglasses.” These simply won’t do. You must have the official ISO 12312-2 certified eclipse viewing glasses. There are also fake solar eclipse glasses being sold as authentic ISO 12312-2 certified eclipse viewing glasses. The problem is so bad, that Amazon has issued warnings regarding the false claims of some vendors. Attempting to view the eclipse through these non ISO 12312-2 certified eclipse viewing glasses will also cause you to lose your eyesight. There’s one more problem. If you wait until the eclipse begins, and you don’t already own a pair of these ISO 12312-2 certified eclipse viewing glasses, there will be no opportunity to buy them. At the time of this writing (1 week before the eclipse), the ISO 12312-2 certified eclipse viewing glasses are already sold out online. If they were available online, the ISO 12312-2 certified eclipse viewing glasses would never arrive on time. By the time the Total Solar Eclipse begins locally, the retail shops will also be sold out. IT WILL BE TOO LATE. Even if there are a few ISO 12312-2 certified eclipse viewing glasses, a 2 minute window is not enough tme to go and buy them. You must have your ISO 12312-2 certified eclipse viewing glasses now. You may be saying to yourself, “self, why is Spencer taking so much bulletin space to tell us about the eclipse and why isn’t he telling us something pertinent to our salvation?” I hope you realize by now, though I find the Total Solar Eclipse interesting, I’m using this phenomenon as an opportunity to warn everyone. You can change peoples physical & emotional lives. However, none of that means anything if you have to sacrifice what matters most to achieve it. Jesus said that. Nothing in this life can be considered a success if we’ve failed to follow Jesus. He knew that we would become preoccupied with striving for success, but He gave us this warning to keep our priorities straight. It doesn’t surprise me that people will exchange their salvation for earthly treasure. What surprises me is how cheap they sell it. “Or what shall a man give in exchange for his soul? Let’s keep our priorities straight. 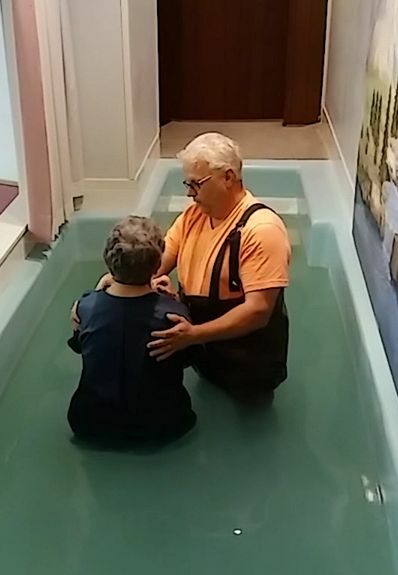 IT IS WITH GREAT joy that we announce a new sister in Christ, Margie. Just as there is joy in the heart of the one who obeys the gospel, there is also much joy in heaven and we are also full of joy for her [Luke 15:7, 10]. 41 Then they that gladly received his word were baptized: and the same day there were added unto them about three thousand souls. That’s where we are with Margie, and all others who obeyed the gospel recently (a young man was also baptized into Christ on the same day.) Nobody joins the church; the Lord adds to the church . 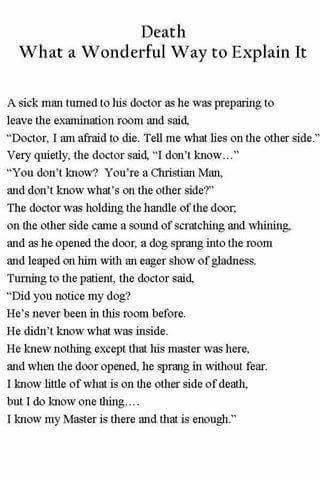 So you see, If you’re IN CHRIST then this little story paints a wonderful picture, but if not, this story gives you a false sense of hope. So you see then, as Christians, we are looking forward to being with our Master just as the story depicts, but it’s not a blind faith. Many folks claim to be a Christian, but this claim is often based on dumb little facebook pics such as this one. Truly a blind faith, a faith based only on desire and not according to knowledge. THE GREATEST CONFUSION in Christendom is the question, “What saves us?” Though we differ in other areas, knowing this one point is of utmost importance. If we get this one wrong, all the rest is just pointless. The groups in Borger Texas, that teach a salvation by faith alone are: First Baptist church, Grace Fellowship, Faith covenant, First united Methodist, Keeler Baptist, Calvary Baptist, Gateway Baptist, Southside Baptist, Cornerstone church, Wesley United Methodist, Fairlanes Baptist, First Presbyterian, Fellowship Baptist, St. Andrews united Methodist, Borger Word of Life, Good Shepherd Lutheran, perhaps others. Can you find your church in the Bible? Since we’ve listed most of the churches in Borger, let’s take a moment and learn what Jesus named His church. He said, “I will build MY church.” (emphasis mine) [Matthew 16:18]. In architecture, the builder gets to do the naming. Since Jesus is the BUILDER, FOUNDATION, CORNERSTONE, & PURCHASER, which of the below names harmonizes all of these scriptures? It seems to me that the most harmonious name of the organization that Jesus purchased, built and DIED FOR is the church of Christ.